Invite your friends to become part of the largest touring community in Europe and make the most of the great outdoors. As a thank you, when your friends or family join, we'll send you a £10 Club gift voucher which can be used against your membership, site bookings or Club products. It couldn’t be easier for your friends and family to join, just follow the simple steps below. Discover new locations across the UK using Club sites and Certificated Locations. 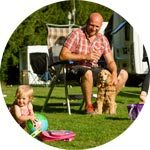 Plus our huge network of European campsites are ready to welcome you on your next holiday. Introduce your friend to our in-house technical advice experts who really know their stuff! They look after members, new and old, armed with their indispensable knowledge. Take out Caravan Cover and you, your friends and family are protected against theft, loss or damage under the same plan. From 2 for 1 show tickets, to afternoon tea, there are plenty of offers to take advantage of; plus huge savings on cars and outdoor gear. If you're an existing member, all you have to do is give your friend/family consent to use your membership number and invite them to join online or by phone. Your friend/family member need to add your membership number into the online join form (after the payment screen) to qualify for the £10 Club gift voucher. Your £10 Club gift voucher will then be automatically posted to you after their membership has been confirmed. When will I receive my £10 Club gift voucher? You'll receive your £10 Club gift voucher within three working days of your family/friends membership being processed. If you have any questions about your gift voucher, please call our Contact Centre on 01342 318 813. What can I use my £10 Club gift voucher on? You can redeem your voucher on UK Club owned site pitch fees (excluding sites in Republic of Ireland, Certificated Locations and Management Agreement sites). You can also use it towards your membership subscription - please call us for details. Yes we sell Membership Gift Packs in our Club Shop. The pack includes a copy of the Sites Directory and Handbook and useful information on how to enjoy Club services, plus an activation form so your friend can activate their membership straight away. Members who buy gift membership in this way will still earn a £10 gift voucher when the recipient activates their membership. If your membership number wasn't added when your recommended friend joined, they'll need to get in touch with our Contact Centre so that we can process your voucher for you.